It was another amazing Robot Block Party at the CARS facility in Stanford. More than 30 companies, startups, STEM groups and individuals demonstrated robots ranging from PR2s to tiny brain powered helicopters. 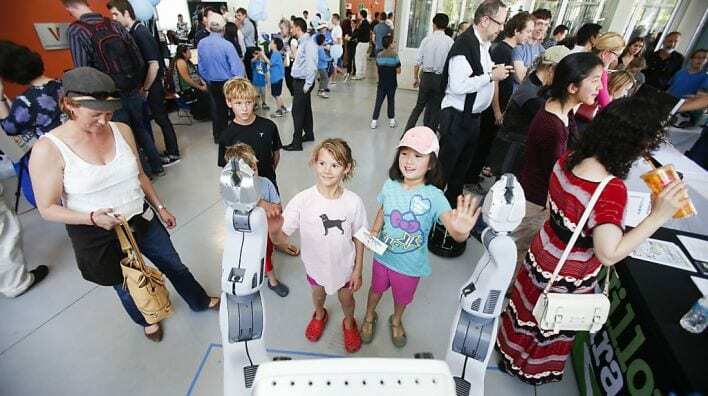 The Block Party was sandwiched between the Robotics and Law conference, “We Robot: Getting down to business” at Stanford Law School and the equally impressive Xconomy forum “Robots Remake the Workplace” at SRI International. Many people who came for one event, stayed in the area a day or two longer for more. We also had a free shuttle running between the Robot Block Party and the Cool Product Expo put on by the Stanford Product Design and Manufacturing Club. They had a wide range of cool hardware products, largely from a crowd funded background, including Double Robotics and Kubi from Revolve Robotics. The shuttle was so popular that we kept it running longer than planned, all the way up to our 6pm network event. Once again Bot&Dolly hosted a great ‘afterparty’ with artisan cocktails, where a lot of networking was done. The weather was on our side this year, making an outdoor evening reception really enjoyable. This year, National Robotics Week didn’t seem to coincide with spring break and although there were still a lot of children enjoying the demos, the audience as a whole was primarily students and staff from Stanford, robotics professionals from other companies and people generally interested in robotics. All up, we had between 1000-2000 attendees. The job fair part of the event produces some quality introductions and we are continuing it online, after getting feedback that it’s generated some successful hires.